Janome has been for long considered one of the premier sewing machine makers in terms of retro designs and modern functionality. The Janome HD1000 is a fine example of what the makers can do, and is a throwback model that will roll over the years of experienced and old school users. The Janome HD1000 sewing machine has been received positively by users and industry experts alike. While many have praised its versatile features and automation, others have voiced their concern over its size and relatively few features compared to other sewing machines within its price range. Let us take a look at the features of the Janome HD1000 to decide whether it’s an ideal sewing machine for you or not. The Janome HD1000 is a heavy duty sewing machine that weighs 22.4 pounds and has measurements at 18.2 x 8.5 x 15.2 inches. This makes it one of the largest sewing machines in a market that is dominated by lightweight and compact models. The Janome HD1000 comes with 14 built-in stitches, including utility stitches and stretch stitches. It also features a four step buttonhole that allows users to create buttonholes on virtually all types of fabrics. The stitch pattern chart is featured on the body which makes it relatively simple to choose between different styles by simply turning the dial. 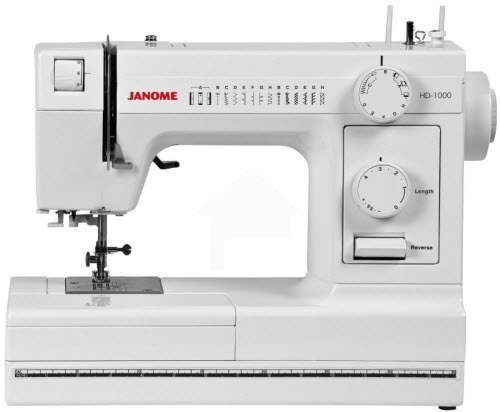 The Janome HD1000 features a cast aluminum body, similar to what sewing machines had around two decades ago. This eliminates the concern of damaged body plate when stitching on light fabrics. It also accounts for high durability in the long term, a factor that Janome has gained competitive edge for. The Janome HD1000 is equipped with a built-in automatic needle threader that saves your eyes from strain while trying to thread the needle. It also comes with a free arm that allows easy and seamless stitching on problematic areas like the pant legs, collars, and cuffs. The drop feed system allows darning, stippling, and attaching buttons with relative ease. The presser foot that comes with the Janome HD1000 sewing machine features more height than regular presser feet. This allows users to stitch across multiple layers of heavy fabrics and materials easily. The extra table space accounts for ease of use when handling large projects or bulky fabrics. To sew thick drapes or heavy upholstery with the Janome HD1000, all you have to do is arm the sewing machine with a 16 number needle and strong thread to slice through the fabrics seamlessly. The thread tension control allows users to adjust the tension when moving from bulky areas to light areas of one fabric. The Janome HD1000 comes with a 25 year limited residential warranty and a host of accessories including bobbins, needles, presser feet, and hem guide among many others. While the front loading bobbin system is something that old school users will find delightful, it is one of the drawbacks of the Janome HD1000 for new users. Fairly simple to set up and use. Great sewing machine for heavy bulk projects. 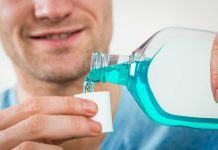 Quality body materials – highly durable in the long term. Can’t be used on delicate fabrics. Poorly constructed bobbin system – new users will find it hard to re-engage the needle at first. Utility stitches – only practical with basic stitching and designing. The Janome HD1000 sewing machine has been essentially marketed as a simple sewing machine, so it automatically eliminates any expectations of being the next big thing in the market. While it is one of the best sewing machines for new users, it can serve well to advanced users as well who have operated conventional sewing machines of the past. Since it is larger than other sewing machines in the market, the Janome HD1000 will require a dedicated space. That being said, it can help new users to improve their basic stitching and quilting skills before they move to more advanced sewing machines. And the fact that it can handle bulk projects makes it a great buy for anyone who wants to sew their pillows and curtains on their own. Overall, the Janome HD1000 is a sewing machine that both new and advanced users will fancy, but the same cannot be said for designers. The Janome HD1000 is a practical choice for users who want to a sewing machine for their residential purposes. Most of its features are manual and that can help new users learn more about sewing and quilting. It provides unmatched consistency on bulk projects and offers reliability and durability in the long term. The Janome HD1000 may not be the best sewing machine in the market but it is one that can be labeled as essential and fundamental for new users. Overall, the Janome HD1000 is a great sewing machine if you are looking for a long term solution to your residential stitching jobs.